Foundation to help his communities in the Dominican Republic and plans to start same foundation in Minnesota...enjoys spending time with family and playing dominos. April 14...Recorded his 1,500th career hit, an RBI-single, on June 16 vs. Boston...Hit 20th home run of the season on June 22 vs. Boston, becoming the only player with at least 20 home runs in each of the last 10 seasons, dating back to 2009...Named AL Player of the Week for June 18-24 (5th career honor), hitting .500 (12-for-24) with eight runs, two doubles, one triple, three home runs, eight RBI, two walks, a .538 on-base percentage and a 1.042 slugging percentage (1.580 OPS) in six games...Hit .326 (31-for-95) with 20 runs, three doubles, one triple, 11 home runs, 24 RBI, 14 walks, a .418 on-base percentage and a .726 slugging percentage (1.144 OPS) in 26 June games...among American League leaders for the month of June, ranked first in slugging percentage, first in OPS, tied for first in home runs, third in RBI, tied for sixth in runs, seventh in on-base percentage and 14th in average...Earned his sixth career All-Star selection, his fifth in the last six seasons (also: 2009, 2013, 2014, 2015 and 2017)...drew a walk in his only plate appearance at the All-Star Game in Washington, D.C... Recorded 1,000th career RBI with a solo home run on September 12 vs. San Diego...became the 11th active player to record at least 1,000 career RBI and the sixth player to record his 1,000th RBI in a Mariners uniform...Hit his 35th home run of the 2018 season on September 12 vs. San Diego, becoming only player in baseball to reach the 35-home run plateau in each of the last five seasons since 2014 and the fifth player in Major League history with at least five seasons of 35-or-more home runs at age-33 or older, joining Barry Bonds (6), Rafael Palmeiro (6), Henry Aaron (5) and Babe Ruth (5)...Hit 21 home runs at Safeco Field, tied with Richie Sexson in 2005 for most home runs at Safeco Field in a single season...his 21 home runs at home were fifth-most in the AL/ninth-most in the majors...Hit by a pitch 14 times, the fourth-most in the AL...Had five home runs that were estimated at 440 feet or further (Statcast), tied for third-most such home runs in baseball (also: Nolan Arenado-COL and Giancarlo Stanton-NYY)...trailed only Trevor Story-COL (9) and Joey Gallo-TEX (7)...Finished eighth in the AL in home runs (37), ninth in RBI (97), 11th in slugging percentage (.509) and 14th in OPS (.850). The Totals- Hit .288 (160x556) with91 runs, 28 doubles, 39 home runs,119 RBI, 12 HBP, 70 walks, a .375on-base percentage, a .549 sluggingmark and a .924 OPS in 155 gameswith the Mariners...Leader- Led the American Leaguein RBI with 119…became the first Mariner to lead the AL in RBI sinceBret Boone in 2001 (141 RBI)...Aging Gracefully- In his age-36season, tied with Kansas City's HalMcRae, who led the AL with 133 RBI in 1982, as the 2nd-oldest player to lead the AL outright in RBI…only Edgar Martinez, who was 37 when he collected a league-leading 145 RBI for the Mariners in 2000, has been older when leading the Junior Circuit outright in RBI...Honors- Named the Mariners Player of the Year by the Seattle chapter of the BaseballWriters Association of America...Designated to Homer- Hit 38 home runs as a DH, most in club history (previous: EdgarMartinez, 37 HR, 2000)...RBI Machine- Collected at least 100 RBI for the 2nd consecutive season (also: 105 RBI,2016)…is the 10th Mariner with multiple seasons of 100+ RBI...Milestone Home Run- Belted his 300th career home run on July 7 vs. Oakland…became the 7th player to hit his 300th career home run with the Mariners... Shooting Star- Made his 5th career All-Star Game appearance…went 0-for-2 in Miami ...Keeping it 100- Recorded his 100th home run as a Mariner on June 4 vs. Tampa Bay inhis 362nd game with Seattle…his 362 games to 100 home runs with a single team areT5th-fewest in Major League history…trails only Babe Ruth-NYY (250 G, 8/18/1921), Alex Rodriguez-TEX (295 G, 8/30/02), Roger Maris-NYY (297 G, 10/1/1961) and Cecil Fielder-DET (335 G, 4/20/92) while tied with Carlos Peña-TB (362 G, 6/27/09)...Batting Clean-Up- Led the Major Leagues with 108 RBI while batting clean-up...Road Runner- Led the American League with 59 RBI on the road...Run Producer- Tallied 50 hits with runners in scoring position, 2nd-most in the American League, trailing only teammate Robinson Canó (51)...Go Ahead- Ranked T2nd in the AL (also: Albert Pujols-LAA) with 29 go-ahead RBI...Walk it Off- His 3 walk-off hits equaled the single-season club record, shared by 8 other Mariners: Bruce Bochte (1980), Tom Paciorek (1981), Todd Cruz (1982), Al Cowens(1984), Jim Presley (1986), Russ Davis (1997), Jose Lopez (2009) and Ichiro Suzuki (2009)...Slow Start- In his first 18 games of the season (4/3-21), hit .246 (16x65) with 6 runs, 4doubles, 2 home runs and 8 RBI... Heating Up- From April 22 - May 25, hit .330 (32x97) with 14 runs, 4 doubles, 10 homeruns, 32 RBI and a 1.079 OPS (.398 OBP, .680 SLG) in 28 games...Streaking- Hit safely in 15 consecutive games, April 19 - May 6, batting .439 (25x57) with 11 runs, 5 doubles, 5 home runs, 20 RBI and a 1.297 OPS (.507 OBP, .789 SLG)…marked the 3rd longest streak of his career.2nd Half Surge- Hit safely in 26-of-his-first-33 games after the All-Star Break, batting.302 (38x126) with 25 runs, 14 home runs, 30 RBI and a 1.078 OPS (.388 OBP, .690 SLG)...Award Season- Selected as a nominee for the Heart and Hustle Award as well as theHank Aaron Award…was a finalist for the Marvin Miller Man of the Year Award. Hit .287 (169x589) with 96 runs, 27 doubles, 1 triple, 43 home runs, 105 RBI, a .360 OBP & a .555 slugging percentage in 155 games...Collected 105 RBI, trailing only his career-high of 108 RBI set in 2014 with Baltimore...Hit 33 home runs as a designated hitter, 2nd-most in club history (Edgar Martinez, 37 in 2000)...Led Majors with 19 home runs vs. lefties…the 19 homers vs. lefties are 3rd-most in single season in club history, trailing Ken Griffey Jr. (21 in 1998 & 21 in 1996)...Led Majors in road home runs (26), 2nd in slugging (.616), 4th in road RBI (62)...Ranked 4th in Majors in at-bats/home run of 13.70 (589 AB, 43 HR)...Ranked T4th in Majors (also: Miguel Cabrera-DET) with 13 home runs in the 7th inning or later…since 2014, leads MLB with 42 home runs in 7th or later...Ranked T4th in MLB (also: Manny Machado) with 15 2-strike home runs, trailing Todd Frazier (20), Chris Carter (16) & Mark Trumbo (16)...Recorded a career-high 52 multi-hit games (previous: 49, 2015)...Hit 10 home runs in 19 games against Los Angeles - AL this season, the most homers vs. any single opponent in a single season in club history...Has hit 87 home runs in his first 2 seasons with Seattle (2015: 44 HR & 2016: 43 HR), a club record for most home runs in a player's first 2 seasons ahead of Richie Sexson (73, 2005: 39 HR & 2006: 34 HR)...One of 6 players with 100+ home runs and 300+ RBI over last 3 years (2014- 16)… Nolan Arenado, Josh Donaldson, Edwin Encarnacion, David Ortiz and Mike Trout...Hit 87 home runs in first two seasons with Seattle (44 HR in 2015 & 43 HR in 2016) behind only Ken Griffey Jr. in 1996-97 (105 total HR-49 in '96 & 56 in '97), 1997-98 (112 total - 56 in '97 & 56 in '98) and 1998-99 (104 total - 56 in '98 & 48 in '99)...Recorded his 250th career home run on May 20 at Cincinnati...Reached All-Star Break with 23 home runs, 2nd-most in career in first half (28 HR in 2014 w/BAL)…1 of 7 Mariners (done 12 times) to collect 23 or more home runs before break, joining Ken Griffey Jr. (5x), Alex Rodriguez (2x), Bret Boone, Raul Ibanez, Jay Buhner and Edgar Martinez…third player in club history with 20+ home runs before Break in age-35 or older season (also: E. Martinez, 23 HR, 2000- age-37 season & R. Ibanez, 24 HR, 2013- age-41 season)...Had 7 RBI on July 23 at Toronto, the 3rd time in career with 7+ RBI vs. Toronto (also: 8, July 22, 2011 & May 25, 2012 w/Texas)…joins Hall of Famer Ralph Kiner as only two players in MLB history to drive in 7+ runs vs. single opponent at least three times…Kiner did so vs. Brooklyn three times (8, June 25, 1950 & 7, May 9, 1950 & July 18, 1951)...Reached base safely via a hit or walk in 25 consecutive road games, June 23-Aug. 27, hitting .304 (28x92) with 18 runs, 1 double, 10 home runs, 18 RBI and 11 walks…from June 23 through end of season, recorded a hit or walk in 37 of 39 road games...493-foot homer off Tyler Duffey Sept. 24 at Minnesota…according to Statcast, was 2nd-longest home run of 2016, trailing Miami's Giancarlo Stanton (504 off Chad Bettis on Aug. 6 at Colorado). Totals - Hit .302 (178x590) with 90 runs, 22 doubles, 1 triple, 44 home runs, 93 RBI, a .369 onbase percentage & .566 slugging percentage in 152 games. ... AL Leader - Amongst AL leaders: 2nd in HR (44), 3rd in SLG (.566), 4th in OPS (.936), T11th in multi-hit games (49), T8th in average (.302), T12th in RBI (93), T10th in XBH (67). ... Clutch - T5th in A.L. with 27 goahead RBI and T7th with 14 gamewinning RBI…hit .291 (43x148) with runners in scoring position. ... Team Leader - Led the team in runs (90), home runs (44), RBI (93), walks (59), average (.302), on-base percentage (.369) & slugging percentage (.566). ... Career Bests - Set career highs in runs (90), hits (178), home runs (44) and walks (59). ... 40 HR - 69th player in MLB history to log multiple 40-HR seasons in a career. ... Mariners with 40+ HR - 4th player in Mariners history to record a 40-HR season, first since Alex Rodriguez (41) in 2000: Ken Griffey Jr. (6), Jay Buhner (3), Alex Rodriguez (3)…2nd player to record a 40-HR season during the Safeco Field era (opened July 1999). ... Back-to-Back - First player since Miguel Cabrera (2012-2013) to record consecutive 40-homer seasons...53rd player with consecutive 40-HR seasons. ... Home Slugger - Hit 17 home runs at Safeco Field, T4th in ballpark history (R. Sexson, 21, 2005). ... All-Star - Voted as the starting designated hitter for the American League (0x2)…4th AllStar game selection (2009, 2013-2015) and second start (also: 2014). ... Injury - Missed 6 games Sept. 4-9 with strained right quad…hit .247 (20x81) upon return. ... The Streak - Reached base safely in career-high 37 straight games July 18-Aug. 27 (previous best: 25 G in 2010 with Texas)…on-base streak was 3rd-longest in A.L. in 2015 and 6th-longest in Majors…during streak hit .355 (54x152) with 32 runs, 9 doubles, 18 home runs and 1.200 OPS…streak is 12th-longest in club history, and longest since 43- game streak by Ichiro in 2009 (record is 47 by Alvin Davis in 1984). ... Extra Base Streak - Recorded an extra-base hit in 9 consecutive games July 31-Aug. 9, the 2nd-longest streak in club history (Ken Griffey Jr., 10, July 19-29, 1993). ... Right Pop - Tied Jay Buhner (1996) for club record with 44 home runs by right-hander. ... Crushed Lefties - Ranked 3rd in A.L. & 4th in Majors hitting .357 (60x168) with 9 doubles, 1 triple, 14 home runs, 27 RBI & a .683 slugging percentage against left-handed pitchers… his .673 slugging percentage and 14 home runs led A.L. (tied in HR with Todd Frazier). ... Road Power - MLB leading 27 home runs on road, T3rd-most in club history behind Ken Griffey Jr. (29 in 1997), Alex Rodriguez (28 in 2000) & tied with Jay Buhner (1997). ... OF vs. DH - As outfielder hit .337 (105x312) with 55 runs, 11 doubles, 31 home runs, 59 RBI and a 1.072 OPS in 80 games; as the designated hitter, hit .263 (73x278) with 35 runs, 11 doubles, 1 triple, 13 home runs, 34 RBI and a .783 OPS in 72 games. ... Pre-Break Power - 8th Mariner with 20+ home runs prior to All-Star break (18x). ... Walk Off - 8th career walk-off RBI with 1B off Junichi Tazawa in the 9th 5/15 vs. BOS (last: 4/19/15 against TEX Neftali Feliz, 1B). ... Worthy April - April AL Player of Month… first career POM Award & first Mariners position player since Ichiro (Aug. 2004)… hit .322 (28x87) w/10 HR, 3 2B, 3B, 22 RBI. ... Player of the Week - Named A.L. Player of the Week for April 13-19…hit .500 (12x24), 7 R, 6 HR, 10 RBI, 1.806 OPS. ... #200 - Hit 200th career home run April 13 at Los Angeles (NL), a first-inning 2-run homer. ... 20 HR - Hit at least 20 home runs in 7 consecutive seasons…one of three players with active streak of 7 consecutive 20-HR seasons. ... 5 Straight...Twice - Homered in 5 consecutive games July 31-Aug. 4, his second home run streak of 5 games in 2015…5th player in MLB history to homer in at least 5 consecutive games twice in the same season: Harmon Killebrew (1970 Twins), Frank Thomas (1994 White Sox), Barry Bonds (2001 Giants), Chase Utley (2008 Phillies)…also homered in 5 consecutive games April 11-15 (6 HR during streak)…tied for 2nd-longest home run streak in club history: Griffey Jr., 8; Cruz, Buhner (2x), Zisk, A. Rodriguez all 5 games. ... April Showers - 10 HR in April were 3rd-most in club history (Ken Griffey Jr. - 13 in '97, 11 in '98)...10 HR were most in any April in his career (had 7 in '11 and '10) and 2nd-most in a single month (13 in May 2014). Led the Majorswith a career-high 40 home runs... Named MVP bymembers of the Baltimore media... Made the AL All-Star Team for the 3rd time, earning his ﬁrst fan-elected start as DH with over 3-millionvotes…went 0-for-2 with a strikeout... Led Baltimore to the AL East title and appeared in thepostseason for the for the fourth timein his career…combined to bat .357(10x28) with 2 home runs and 7 RBI in7 games (lost ALCS vs. KC)... Finished 7th in the AL MVP voting (102.0 points)... Hit at least 20 home runs for the sixth consecutive season…joins Mark Reynolds, Hunter Pence, David Ortiz, Brian McCann, Matt Holliday and Miguel Cabreraas only players with 20+ homers in each season since 2009... Named the American League Player of the Week May 26-June 1(.476/10x21, 5 R, 3 2B, 4 HR, 8 RBI) & Sept. 1-7 (.407/11x27, 6 R, 2B, 3B, 4 HR, 12 RBI)... Finished 3rd in the American League in RBI (108), extra-base hits (74) andtotal bases (322), 6th in slugging percentage (.525)... Set single-season career-highs in plate appearances (678), runs scored(87), hits (166), home runs (40), RBI (108), walks (55), extra-base hits (74), and total bases(322) and tied his career-high with 159 games played... Went 4-for-5 with a triple, 2 home runs and 7 RBI Sept. 7 at Tampa Bay... Collected career-high 5 hits, July 5 at Boston... Established Orioles May club record with 13 home runs... Hit 28 of 40 home runs prior to the All-Star break (.287/102x356)…hit .249 (64x257) with 12 home runs in 66 games in the second half... Made Baltimore debut March 31 vs. Boston going 1-for-2 with a walk andeventual game-winning home run in the 7th inning off Jon Lester…third career Opening Day HR (also: 2010 & 2011 with TEX). Named an AL All-Star for the second time in his career (also 2009), hitting 27 homeruns in 109 games…ranked 7th in the AL with a 5.43 AB/RBI ratio (min. 400 AB)…missed 50 games, August 5-Sept. 29, when he was placed on the restricted list (50-gamesuspension from MLB - Joint Drug Prevention and Treatment Program)…reinstated forthe Wild Card tiebreaker, game #163, Sept. 30 vs. TB, going 0-for-4 as the DH. Played his 1st full season in the major leagues without a stint on the disabled list or in the minor leagues...ranked among the A.L. leaders in doubles (4th, 45), extra base hits (9th, 69), and games (T10th, 159)...topped the Rangers in games and doubles, ranked 3rd in extra base hits, RBI (90), and homers (24, tied), and ranked 4th in runs (86), total bases (269), and slugging (.460)...set career highs in games, at bats (585), runs, hits (152), doubles, total bases, extra-base hits, and RBI...matched the 5th-highest single-season total for doubles in club history, most since Mark Teixeira (45) in 2006...grounded into just 7 double plays, an average of one every 83.6 at bats, the 9th best ratio in the league...BATTING: Went 4-for-29 (.138) over season's 1st 8 games, then hit .414 (12-29) in next 6 games from April 14-21(G1) to rise to .276...batted .151 (8-53) with 2 extra-base hits - both doubles - from April 21(G2)-May 6 to drop to .216...had a .358 (29-81) average in a 20-game stretch from May 7-28, rising to .276, highest figure all year after the end of April...beginning June 3, his season average never got higher than .270 or lower than .253 the rest of year...batted .253 (96-379) in final 107 games to finish at .260...his 14 games of 3+ hits tied for 12th in the A.L...had season-high 4 hits twice: May 13 vs. LAA and May 25 vs. Toronto, grand slams in both games...longest hit streak was 8 games, August 5-13...went 5-for-13 (.385) with the bases loaded with 20 RBI, 3rd in A.L...is batting .325 (113-348) over last 3 seasons vs. LHP...career average at Rangers Ballpark in Arlington is .299 (366-1226), 8th highest in club history (min. 1200 AB)...MISCELLANEOUS: Started 146 games in RF, 2 in LF, and 7 at DH... played every inning of Rangers' 1st 36 games in the field and started 59 of 1st 60...played in each of Rangers' final 100 games beginning June 13...had a .987 fielding pct. (4 E/301 TC) in the outfield...tied for 8th in the A.L. with team high 9 outfield assists...threw out Mike Trout at 3rd base attempting to advance on a fly out in day game Sept. 30 vs. LAA...had a career-high 140 strikeouts, 2nd-most among Rangers..was ejected by Bill Welke for arguing balls and strikes, Aug. 31 at CLE...had been hitless in 19 career pinch at bats before single on August 16 at NYY...has a .417 (25-60) career average in 15 games at Fenway Park, the 2nd-highest since 1921 for any player with at least 50 AB behind Will Clark at .434 (43-99)...WINTER BALL: Played for Gigantes del Cibao in the Dominican Winter League, batting .286 (12-42) with one homer and 4 RBI in 11 games. Cruz was hampered by leg injuries for a second straightyear and appeared in just 124 games due to 2 stints on the disabled list...despite that, ranked among the American League leaders in slugging (11th, .509) and home runs (T13th, 29)...averagedone home run every 16.38 at bats, 7th-best in the league...rankedamong team leaders in slugging (3rd), home runs (4th), RBI (4th,87), and doubles (5th, 28)...established career bests for at-bats(475), RBI, and total bases (tied-242)...started 98 games in right,16 in left, and 8 at DH. Despite playing in just 108 games due to injuries, was 2ndon the club in steals (17), placed 3rd in doubles (31) and homers(22), ranked 4th in RBI (78), and was 5th in hits (127) ... set careerhighs for hits, doubles, triples (3), and RBI ... among all A.L. playerswith at least 400 plate appearances, had the 5th highest sluggingpercentage (.576), and ranked 6th in batting average (.318) andOPS (.950) ... started 91 games in right, 10 in left, and 2 at DH...his .371 (73-197) home avg. was 104 points higher than road avg. (.267, 54-202) ... hit .336 (42-125) with runners in scoring position,which would have ranked 8th in the A.L. if had enough plate appearancesto qualify ... batted .359 (46-128) with 14 doubles, 8 HR,and 33 RBI in 32 games against A.L. East opponents. In his first full major league season, Cruz was selected to the American League All-Star Team and produced just the 5th 30-homer/20-stolen base year in club history...led the Rangers with 33 homers, a .524 slugging percentage, and 6 intentional walks andwas 2nd with a .332 on-base percentage, 49 walks (tied), and an .856 OPS...also ranked 3rd on the team in RBI (76), runs (75), andstolen bases (20), and placed 4th in batting average (.260), extra base hits (55), and total bases (252)...ranked T8th in the A.L. inhomers and had the 13th-best slugging percentage...started 117 games in right, 2 in left, and 4 as the designated hitter. Batted .330 (38-115) with 7 home runs, 9 doubles, and 26 RBI in 31 games for the Rangers...Texas purchased his contractfrom Oklahoma on Aug. 25 when Jason Ellison was designated for assignment, and Cruz started each of the team's final 31 gamesin right field...compiled best strikeout-to-walk ratio of any season in his big league career, 17 walks to 28 K's...starts in batting order:7th (23), 5th (4), 6th (3), and 8th (1)...hit .419 (13-31) against lefties and .298 (25-84) vs. right-handers, although 6 of his 7 homerscame against right-handers...hit .351 (20-57) with 4 HR, 12 RBI, .431 OBP, and .632 slugging pct. over 15 games at RangersBallpark...with his Aug. 25 debut, became the 53rd player used by Texas in 2008, breaking the previous team record of 52...beginningAug. 30, would hit safely in 22 of his final 26 games at .361 (35-97), going hitless in consecutive games just once (Sept. 20-21)...snapped 0-for-16 stretch with 4th-inning single on Aug. 30 at LA of Anaheim...compiled a trio of 6-game hit streaks...had 5three-hit games, tied with Josh Hamilton for most among Rangers during his tenure...posted 3rd career multi-homer game on Sept.6 vs. Boston in Rangers' 15-8 victory...his 2 homers and 5 RBI in that game were both season highs and matched his career bests(3rd time each)...beginning with that game, hit 6 of his 7 home runs over the Rangers' final 20 contests...went 3-for-5 with 2 doublesand 4 RBI on Sept. 14 at Oakland...finished season with a 6-game hit streak at .385 (10-26), posting a double or homer in each ofthe club's final 5 games. He finished the season with a career-high 5-game hitting streak, going 6-for-19. He batted .264 (14-53) over his last 13 games with 4 extra base hits (2 2B, 2 HR) and 9 RBI. ... He ranked 4th among American League rookies with 15 RBI in September and also tied for second among AL rookies with 4 HRs. He had three hits including two home runs and 5 RBI 9/4 at OAK. It was his first career multi-homer game ... 5 RBI were a career-high and 2nd-most by a rookie in club history. He has a grand slam in his only career at-bat with the bases loaded, on Aug. 16 against the Angels. He hit first career home run 7/31 at Minnesota. He was acquired from Milwaukee in a 6-player traded on 7/28. He spent the entire 2006 season at Nashville (AAA) before the trade, batting .302 (112-371) with 22 doubles, 20 home runs, 73 RBI and 17 stolen bases. He was among Pacific Coast League leaders in home runs and RBI before the trade and started for PCL at 2006 AAA All-Star game. Earned the Brewers Robin Yount Performance Award for Minor League player of the year with a combined 27 home runs, 81 RBI and a .289 battingaverage...began the season with Double A Huntsville where he played 68 games hitting .306 (76-248) with 35 extra-base hits and 54 RBI...promoted to Triple A Nashville on June 29 and recorded a .269 batting average in 60 games for the Sounds with 11 roundtrippers and 27 runs batted in...appeared at all three outfield positions with Nashville, playing primarily in right field...recorded a nine-game hitting streak July 2-July 15 (#2) for Nashville...hit .433 (13-30) with a pair of home runs and four RBI during the stretch...named the PCL Championship Series MVP with four home runs and 11 runs batted in during the series...plated the Sounds game-winning runs with a three-run homer with two outs in the top of the 13th inning on Sept. 16 leading Nashville to a 5-2 win over Tacoma...it was Nashville's first league title (three-game sweep) since winning the Southern League Championship in 1982...recalled Sept. 17 from Triple A Nashville, a day after the Sounds defeated the Tacoma Rainers (Seattle) in the Pacific Coast League Championship Series...made his Major League debut Sept. 17 at Houston when he entered the game in right field in the eighth inning replacing Geoff Jenkins...flied out to centerfield in his first Major League at-bat...recorded his first Major League hit with a double in the eighth inning off Jason Standridge September 28 vs Cincinnati...named the eighth-best player in the Brewers organization by Baseball America. Split the season between Class A Modesto, Double A Midland and Triple A Sacramento...combined at all threestops to hit .326 with 26 home runs and 100 RBI in 137 games...established career highs in games, at-bats (536),runs scored (109), hits (175), doubles (42), home runs, RBI, walks (51) and strikeouts (149)...his batting average,slugging percentage (.562) and on-base percentage (.390) were his best in his four seasons in the United States...tied for fourth among all minor leaguers in runs scored, ranked fifth in total bases (301), and tied for sixth inhits...finished second in the A's farm system in batting and RBI and third in home runs...batted .362 (55-152)against lefties and .313 (120-384) against righties...hit .367 (55-150) with runners in scoring position and was7-15 (.467) with two grand slams and 16 RBI with the bases loaded...batted .361 (95-263) at home compared to.293 (80-273) on the road but hit 17 of his 26 home runs on the road...had 54 multi-hit games, including 16 withthree-or-more hits...appeared in 79 games in right field, 55 in left field and 10 in center field...batted .354in the fourth spot (57-161)...began the year at Modesto where he batted .345 with 11 home runs and 52 RBI in66 games...added 24 walks for a .407 on-base percentage...finished second on the club with eight stolenbases...hit .383 (36-94) in May and .402 (35-87) in June...hit a grand slam in the bottom of the eighth inningApril 26 vs. Stockton...had his first of two four-hit games May 20 vs. Rancho Cucamonga going 4-4 with five RBI...batted .490 (25-51) during a 12-game hitting streak June 10 - 21...hit a career-high three home runs, drovein a career-high six runs and had his second four-hit game of the season June 15 at Visalia...was promoted toMidland June 23...hit .331 (42-127) over a 37-game stretch from July 3 - August 10 including a 14-game hittingstreak July 15 - 30 where he hit .365 (19 for 52) with five home runs and 13 RB...concluded his season withMidland with a 21-game hitting streak beginning on August 11 batting .392 (38-97)...concluded the year batting.313 with 14 home runs and 46 RBI in 67 games at Midland and finished second in home runs... advanced toSacramento September 3...went 1-4 in his first game beginning a 22-game hitting streak. ...went 3-10 in 21 innings August 14 at San Antonio to start a stretch of nine straight multi-hit games through August 23 where he batted.455 (20-44)...homered in three consecutive games August 27 - 29. Spent the season at Class A Kane County...belted 20 home runs ranking fourth in the A's farm system...also ranked fourth in the Midwest League in home runs and was tied for fourth in strikeouts (128)...led KaneCounty in home runs, RBI (85), and strikeouts...batted .278 (30-108) against lefties and .227 (82-362) againstright handers...was 4-13 (.308) with a grand slam and 20 RBI with the bases loaded...appeared in 106 gamesin right field and 17 in centerfield... batted .273 (47-172) with 11 of his 20 home runs in the first 44 games...hit three home runs April 14 at Beloit and August 24 at Peoria to become the first National Association player withtwo three-homer games in one season since Russell Branyan of Buffalo in the International League in 1999...drove in eight runs including a fourth inning grand slam April 14, and six RBI and four runs scored on August 24...was named Midwest League Player of the Week August 18 - 24 when he hit .563 (9-16) with three home runs,eight RBI and five runs scored in four games...went 4-13 (.308) with a home run and three RBI in the playoffs. Spent the entire season with Class A Vancouver of the short season Northwest League...hit .276 with fourhome runs and 25 RBI in 63 games...led his club in doubles (14) and stolen bases (12) and tied for second in hits(59) and strikeouts (58)...hit .301 with all four of his home runs on the road compared to .252 at home...appeared in 40 games in right field, 17 in left field and eight in center field...put together his best batting averagein July when hitting .377...had a season-high four hits September 2 at Salem-Kaiser. Spent his first season in the United States and his first season in the A's organization following an August 30,2000 trade in which he was acquired from the New York Mets organization for Jorge Velandia...played for theRookie A's in the Arizona League...hit .250 with three home runs and 16 RBI in 23 games... appeared in 18games in right field and four in center field...belted a grand slam August 23 vs. the Giants. Spent the season with the Mets Eastern Division affiliate in the Dominican Summer League...led the league with 15 home runs and 80 RBI in 69 games... finished fifth in the league with a career high .351 batting average...established professional bests with a .610 slugging percentage, a .434 on-base percentage, and 4 triples. Played for both of the Mets affiliates in the Dominican Summer League ...combined to hit .244 with one home run and 32 RBI in 71 games... stole a career-high 20 bases. Made his professional debut with the Mets affiliate in the Dominican Summer League...hit .271 with one home run and 13 RBI in 30 games. 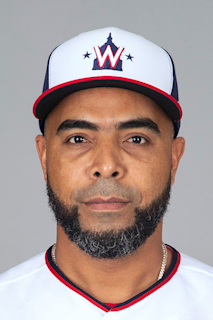 January 2, 2019 Minnesota Twins signed free agent DH Nelson Cruz. October 29, 2018 DH Nelson Cruz elected free agency. April 14, 2018 Seattle Mariners activated DH Nelson Cruz from the 10-day disabled list. April 3, 2018 Seattle Mariners placed DH Nelson Cruz on the 10-day disabled list retroactive to April 1, 2018. Sprained right ankle. January 2, 2017 OF Nelson Cruz assigned to Gigantes del Cibao. December 4, 2014 Seattle Mariners signed free agent DH Nelson Cruz. October 30, 2014 LF Nelson Cruz elected free agency. February 24, 2014 Baltimore Orioles signed free agent LF Nelson Cruz. September 30, 2013 Texas Rangers activated RF Nelson Cruz from the restricted list. August 5, 2013 Texas Rangers placed RF Nelson Cruz on the restricted list. December 6, 2012 RF Nelson Cruz assigned to Gigantes del Cibao. September 13, 2011 Texas Rangers activated RF Nelson Cruz from the 15-day disabled list. May 23, 2011 Texas Rangers activated RF Nelson Cruz from the 15-day disabled list. May 20, 2011 Frisco RoughRiders sent RF Nelson Cruz on a rehab assignment to Round Rock Express. May 16, 2011 Nelson Cruz assigned to Frisco RoughRiders. August 30, 2010 Texas Rangers activated RF Nelson Cruz from the 15-day disabled list. August 26, 2010 sent RF Nelson Cruz on a rehab assignment to Frisco RoughRiders. June 22, 2010 Texas Rangers activated RF Nelson Cruz from the 15-day disabled list. June 18, 2010 sent RF Nelson Cruz on a rehab assignment to Oklahoma City RedHawks. May 30, 2010 Texas Rangers placed RF Nelson Cruz on the 15-day disabled list retroactive to May 29, 2010. Strained left hamstring. May 14, 2010 Texas Rangers activated RF Nelson Cruz from the 15-day disabled list. May 11, 2010 sent RF Nelson Cruz on a rehab assignment to Oklahoma City RedHawks. April 27, 2010 Texas Rangers placed RF Nelson Cruz on the 15-day disabled list. Strained right hamstring. October 16, 2009 RF Nelson Cruz assigned to Gigantes del Cibao. August 20, 2009 Texas Rangers activated RF Nelson Cruz from the 15-day disabled list. August 17, 2009 sent RF Nelson Cruz on a rehab assignment to Oklahoma City RedHawks.